Acrylic on compressed hardboard. This painting was commissioned by her husband as a Christmas present for a lady who had made a special study of the species, in Manitoba. Chimney Swifts are found throughout much of eastern temperate North America. In the west they are replaced by the very similar Vaux’s Swift. Both are rather drab, dark brown, lightest on the throats. Chimney Swifts are so named because they often nest, and roost, in tall chimneys, although originally, before such structures were available, they nested in tall, hollow trees, and sometimes still do. The chimney has to not be in use, of course, and since such chimneys are often taken down once they are no longer used, there is a movement among conservationists to save some for the swifts to use. 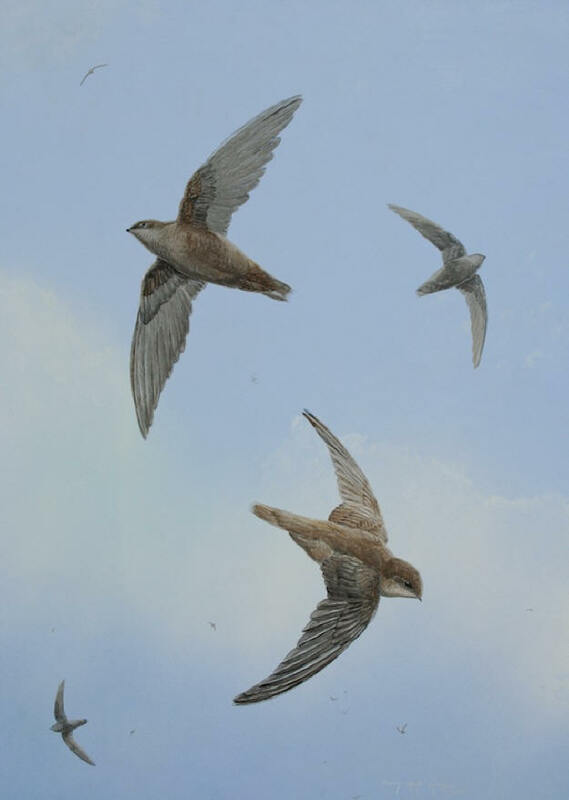 But the Chimney Swift is in severe decline anyway, as are many other species of birds in North America that eat aerial insects. In winter Chimney Swifts completely leave the continent and for many years their winter grounds was a mystery, but apparently they winter in western South America. 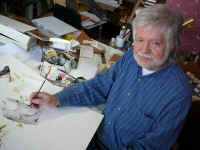 See the next painting for an enlargement of a chimney swift.